Banksy’s work has always been hot property, with some eager collectors going to extremes to take his street art off public walls. Now, one of his prints has reportedly been snatched from a newly opened exhibition of his work in Toronto, The Art of Banksy (until 11 July), and police have opened an investigation into the alleged theft. 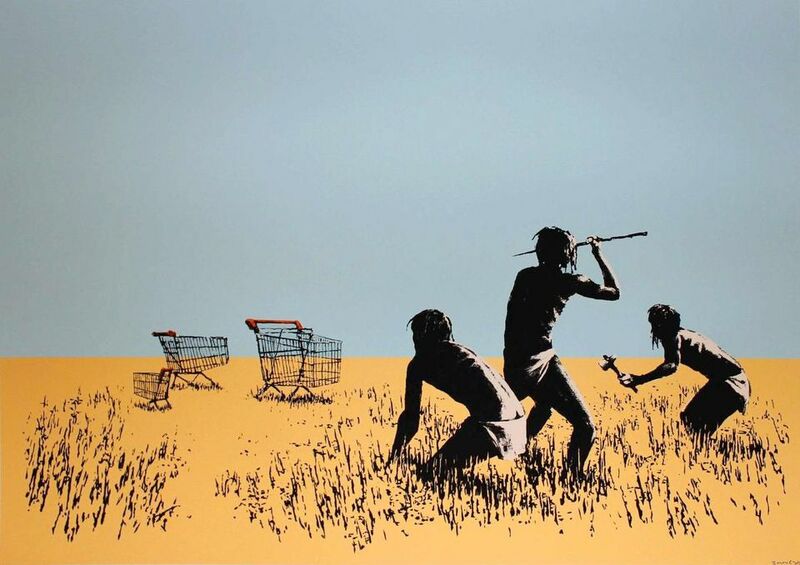 Trolley Hunters, a work that depicts a trio of indigenous hunters confronting a like number of shopping carts and valued at C$45,000, went missing during the setup for the show of around 80 works, organised by Banksy’s former manager Steve Lazarides, with backing from Live Nation and Starvox Exhibits—but without the artist’s involvement. “It’s a beautiful piece and we hope to get it back,” Starvox president Corey Ross told the local press. Held in a former ammunitions factory, the show includes some of Banksy’s best-known work such as Girl with Balloon and the sizeable Flag Wall, a riff on the raising of the flag by US troops at Iwo Jima. Tickets for the exhibition run at C$35, but the price has not deterred fans of the street artists work, with the first run of 50,000 tickets nearly sold out. The art in the exhibition “is not from walls and houses, because that belongs there”, says Michel Boersma of Live Nation. According to the press release, all the works were “made for collectors or for installations and exhibitions”. Banksy, however, was not involved in the show and he and Lazarides parted ways years ago. “We got to a crossroads,” Lazarides says of the split. “He’s a full-time job.” But the demand for Banksy remains high, and Lazarides has been happy to fill that need. “The public have a right to see his work,” he says. Banksy’s art has appeared on Toronto’s streets in the past, notably on the heels of the documentary Exit Through the Gift Shop in 2010.